When I stepped out the front door this morning, I had a sudden urge to detour around to the garden before heading down to the barn. The morning light was beautiful, and I thought I might find a photo. Okay, busted. I was mainly going to see if anything in the garden had been ravaged during the night. I only gave the garden a cursory glance, though, because my attention was drawn to something much more interesting. 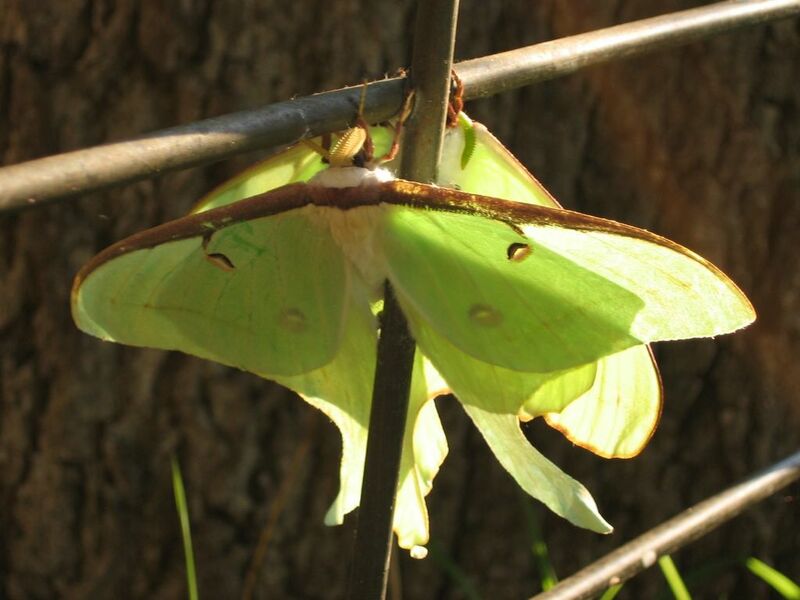 I have seen these beautiful Luna moths before, but never two at once--and never intertwined. They are large, with wings that span four inches across. They stayed like that for several minutes while I stared, fascinated. Four hours later, they were still there. I lightly tickled each one with a blade of grass, just enough to see if they were alive--yes. I suppose they may have been busy making more moths (I know nothing of moth mating habits). I do know that pressed together, holding tightly to each other's little legs, it was quite a romantic scene--and a glorious morning surprise. I am thrilled the photos I took came out. Click here if you would like to see the rest of them. A year of Daily Photos ago: Baaaaaa! Ain't so much a moth. It's a super-hero caterpiller in its bee-oo-ti-ful cape. Takes one to know one. Thanks for sharing. I love the blog. Very cool! You see the most amazing things on that farm of yours. that's a gorgeous photo. wow. Beautiful. I've never seen those before. They look like they might be dancing a ballet together. Heather will be hosting WCB #62 at http://azurelynns.blogspot.com/ if you have a kitty photo to share. Beautiful photo! I first saw Lunas when I went downstairs one summer morning to see these enormous moths clinging to the screen door. The ones I saw were about 8 inches wide, so you can imagine my surprise! This is so beautiful. I hope you don't mind I snagged a copy for my desktop. Love it and the blog. Oh, for heaven sakes...I have NEVER seen anything like that! Incredible. did you ever read girl of the limberlost? Girl of the Limberlost! I thought of that too ... Elnora, yes? The far reaches of norhern Michigan. Thanks for the reminder! Off to the library! The dancing bug strikes! After dancing with the broom it is moth dancing. Great photo. Oh wow, that's beautiful and such a cool photo! four hours?? Okay I can dig that. Gene Stratton Porter....she brings back such memories. After my mom passed away 7 years ago, I spent that summer just recovering from the "2 years from hell" Iwe had been thru. I read many of Porter's books...soothing, and healing. 'Girl of the Limberlost" is one of my favorites. And "The Harvester" is one of the sweetest, most romantic books I ever read. Brings back fond memories. Extraordinary indeed! Beautiful photos. I've only seen Luna moths in magazine photos.